Preheat the oven to 400F. Line a baking sheet with foil or parchment paper. Cook the squash whole in the microwave for 3 1/2 minutes on high. It will be hot so remove it with hand protection. Slice it in half lengthwise, trying to cut through the stem so both halves have a bit of stem on them for presentation. Scoop out the seeds and retain. Rub some of the butter around the cut surface of each squash half. Sprinkle the insides with pepper. 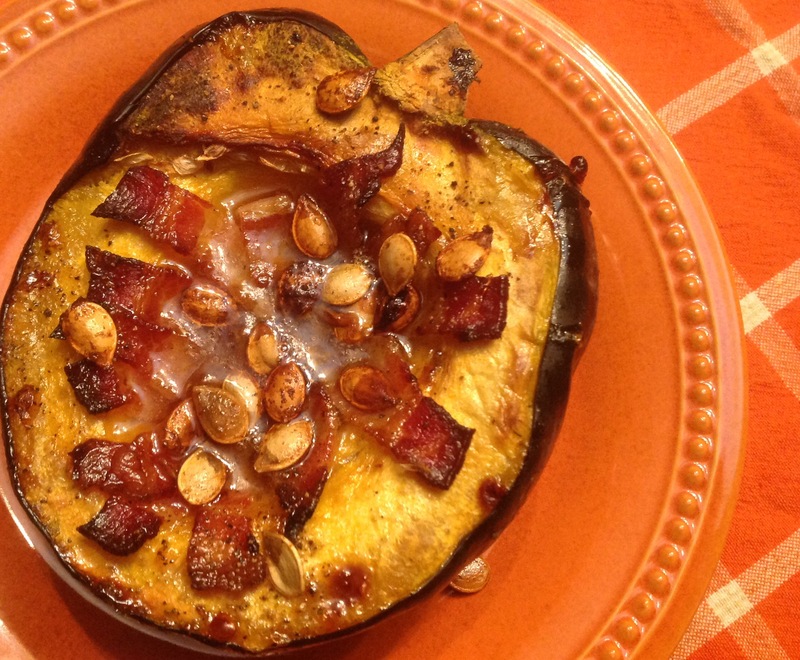 Arrange the strips of bacon around the inner cut edge of the squash cavity. Divide the remainder of the butter in half and place in each cavity. Add a teaspoon of brown sugar in each squash cavity. Drizzle the maple syrup around the top of each squash half and sprinkle a bit of sea salt. What’s your favorite way to enjoy squash? This entry was posted in Recipes and tagged butternut squash and apple cake, butternut squash and kale lasagna, curried vegetarian stew, deep dish butternut squash quiche, Deep dish roasted butternut squash quiche, fall panzanella, fall stuffed whole acorn squash, Maple bacon baked acorn squash, panzanella with squash, roasted wedges of acorn squash, squash and cranberry couscous, squash carbonara, squash keugel, winter vegetarian stew with sweet potato squash cauliflower and raisins by Johanne Lamarche. Bookmark the permalink.